Wild Rice Salad with Nectarines, Peaches and Mint - A recipe from Savor California, the online showcase for extraordinary gourmet foods and beverages from California. Remove wild rice from pouch and break up with your hands. Cut up the nectarines and peach. In a small mixing bowl combine shallot, garlic, orange juice, olive oil, red wine vinegar and sea salt. Adjust salt to taste. 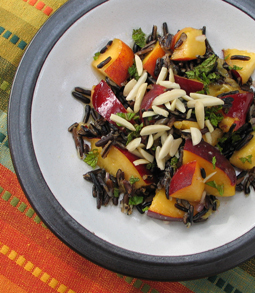 In a serving bowl combine wild rice, peach, nectarines, and mint. Add dressing and mix well. Chill in the refrigerator for at least 15 minutes before serving. This gives the rice and peaches time to absorb the flavors of the dressing. Plate and top with a generous handful of slivered almonds before serving.